As mentioned on The Walking Golfer homepage, there are many benefits of walking when you golf. Please click on each benefit to find more information. The benefits of walking are not limited to the golfer, they extend to the golf course and the surrounding environment. A walking golfer has much less impact on the turf than a golf cart, which is evident any time you play in the rain because you can see where carts have ripped up swaths of grass that will take months to mend. If a golf course or club is walking only, then there is the added benefit of saving expenses on building and maintaining cart paths, while also significantly improving the aesthetics of the course. Cart paths are little more than a long scar on the landscape that disrupt natural sightlines, create artificial man made obstacles and negatively influence an architects ability to freely route the course. A cart path free course is a blank canvas, while the necessity to accomodate cart paths is restrictive to the architect as an artist. Many contend that the costs of building and maintaining cart paths are outweighed by the revenue that is generated from cart rentals. I think this is bogus, and I think that golf courses have a huge opportunity in front of them to benefit from a movement towards walking only golf. Carts bring in revenue, but the turf, cart path and golf cart maintenance costs erode that revenue to a point where it would be advantageous for courses to rent motorized push carts. Electronic push carts are cheaper to purchase and maintain than motorized carts which is great for the golf course, while also providing the walking golfer with a means of walking eighteen without having to carry his or her bag. Being a walking golfer is much better for the golfer, the golf course, the bottom line and the environment. Playing a round of golf today takes far too long , especially during club competitions. Five hours is quite common! Why not try leaving work and turning up 2.5 hours before dark and playing a two ball, the borrows on the green are the same as yesterdays medal! Just get on with it. Tee the ball up and hit it, pick up your bag, find the ball and hit it again. 2.5 hours later 18 holes completed, throw the clubs in the car, back for another 18 holes tomorrow simple. I support the idea that golf needs to get back to its roots and that golf is intended and becomes more pleasurable to the player if he/she walks. There are clearly major benefits that are exclusive to “walkers only” that are not contingent with players who use golf carts. It is my wish that people who play golf seek to find the passion in the game that can only come from a walkers perspective. We need to stop industry from selling us “better ideas”. I was playing golf the other day and watched as a golfer got out of his cart to play his approach shot, when he got out his range finder binoculars to measure the distance, and I thought to myself why doesn’t he love the game? I have come to realize that each new technology that has been invented for golf in the last 40 years has wittled away at the beauty of the game and has left newer generations devoid of appreciation for what this game really has to offer. We don’t need more “assist’s” that stunt skill development and impair enjoyment of the game, we just need to ourselves understand that joy comes from developement of ones self and ones own abilities rather than giving in to gadgetry. This idea needs to spread like wildfire if the essence of golf is not to be lost. You make many valid points that I agree with – our goal with The Walking Golfers Society is to get to the point where we have the numbers to raise our voice and be heard in the industry. Let’s get back to walking friendly courses that are manageable distances for 95% of golfers who shoot above 80 on a regular basis, while also making them fun for the 5% who shoot below that number. Please feel free to join us by visiting the society page on The Walking Golfer. I played 9 holes the other day, and I was the only one walking the very walkable golf course. I teed off alone but eventually caught up to a twosome in a cart. The experience of playing on foot while all the other groups around you playing in carts is somewhat like playing golf on a street in heavy traffic. The carts criss-cross around you as you walk to your ball. The motorized traffic noise. It can be an unpleasant experience. As far as pace of play, unless the golfers in the carts are scratch golfers, they tend to slow us walkers down as well. If the Society wishes to build momentum in raising awareness about the benefits of walking the course then there will need to be a greater presence in the club houses of our nation’s golf courses. A visual reminder as one prepares to pay for their round may help the cause. Walking golf awareness will require placing smelling salts under the noses of able-bodied players who normally gravitate to carts in a zombie state of mind. Golfers in America need a reminder that playing on foot is the better, quality way to play golf! As all members of this society know, there is no better feeling than to walk down the fairway straight to your ball with the “tools of the trade” right at your side. No jumping in and out of carts grabbing a fist full of clubs only to find out when you get to your ball on the other side of the fairway that none of the clubs in your hand is the right club for your next shot. How distracting and time consuming! 1. Mowed grass paths between tee grounds and fairways. Eliminate circuitous routes wherever possible. 2. Construct bridges to cross ravines, or create earth ledges around the edge of ravines. 3. Where possible, group walking tee times together and group cart golfers to a different time frame. 4. Provide adequate drinking water stations. 5. Maintain grass paths away from cart paths to avoid wearing down the cleats on your golf shoes, and allow for a more comfortable walk. I’d like to hear from other society members that can add to this list. I’ve enjoyed reading some of the walking-only golf course reviews on the site. It led me to thinking about my home state. Are there any walking-only golf courses in Ohio? I am due to visit Michigan in late September and will be taking my golf clubs does any one know of any suitable walking golf courses around the EAst side of the lake? Any where within 200 miles fro Grand Rapids? If you seek moderate pricing then The Meadows at Grand Valley State University 15 minutes from Grand Rapids may suit you. They have a walking anytime policy. It is a Hurzdan & Fry design. I was reading the interview with Tom Doak and he mentioned a difficult climb at Crystal Downs. Why couldn’t they put a funicular on that hill? I don’t know how high it is or what it would cost,but things like that might help people walk the course,if there is just one or two steep areas. Twain’s suggestion concerning building a funicular at Crystal Downs reminds me of was done at Rockrimmon Country Club in Stamford, CT. Because of the steep incline from the 9th green to the tenth tee box, a “golfalator” or tram was built from old train tracks and equipment which takes players about 50 feet up to the top. In fact, it crosses the state line between CT and NY and is, therefore, the shortest interstate rail system in the United States! So, there is precedence for what Twain is suggesting. In response to Glen Maringer’s request for comments on what courses can do to encourage walkers, Ballyowen in New Jersey provides a $30 discount for walkers. I walked there today with three other players and three caddies. We must have looked like men from the moon to the “lazy” go-cart riders, but we sure sped up play! The group ahead of us was dawdling until they say this little marching army barreling down on them. We thought it was hilarious! The Ranger thanked us. Walking is the natural and intended way to play golf, and it leads to an enhanced skill level. When you stretch your legs, you get better leg action and more distance. Walking makes you looser and more flexible overall, which aids every aspect of your game. And aesthetically there is no comparison. Thanks Joe for your comment regarding walking incentives. The discount you mentioned can be viewed in two ways. Is it an incentive to walk, or is it a price reduction because a cart will not be used for the round? There needs to be a message coming from course management that they favor the idea of walking their course because it is a win-win for all involved. Good for the golfer, good for the course conditions, and good for the expenses all the way around. Glen: I think you could say that a discount for walking is as much an inducement to walking as it is an avoidance of wear and tear on the carts. What they ought to do, of course is publicize. They probably don’t publicize it prominently because their lawyers would then make them put up equally prominent signs about the risks to people with heart trouble or asthma or every other disease known to man, and the whole thing would become a big bother. Thanks for the tip re Arcadia Bluff, hope to be playing there Monday the 4th of Oct.
Fall golf in the Great Lakes region! What a special time of year to play golf. I hope you really have a great experience, and let us know how it turned out. Thanks for the Arcadia tip, I managed to stay and play at Arcadia Bluffs as recomened, very enjoyable. Over a drink in the bar, I heard about Crystal Downs just up the road. Within 12 hours I had the ball teed up on the first! If you are ever back in the area you must play it. I was told it is the least touched Mackenzie course of them all. Having played the likes of Royal Melbourne I quite agree. It was a pure pleasure and a privaledge to walk and play. Quite frankley the experience was the best days golfing in 2010 todate! Of all the walking courses in the USA this has to be near the top. I’m glad you had a great time. Crystal Downs sounds great. Keep enjoying those walks down the fairway, and hopefully our paths will cross someday. The problem I find, living in Arizona, is that there are far too few golf courses that one can walk. Playing in high school matches has become a bother as most courses are strictly “resort” courses and have far too long of a walk from green to tee. With the exception of a few private clubs around Phoenix and Scottsdale, Arizona has become a cart golf society. Many courses won’t even let you walk! Such a pity. What do you think about We Ko Pa and Talking Stick? I enjoyed playing Saguaro but have not played Cholla or either of the TS courses. Also, have you visited Southern Dunes in Maricopa? Looks like a great course, hoping it is walkable. I have played both courses at Talking Stick, which are very walkable and the fairways are quite wide. Cholla is a great course at WeKoPa as well but the green to tee is not nearly as well-routed as Saguaro is, and there are some hilly parts (one in particular from 17-18), that make it a harder walk. I played Southern Dunes as soon as it became public, and the routing makes it a tough walk as well. There are some holes where you have to walk a pretty good distance to your next tee box. Playing a course as hard as that one from the tips is hard enough already! The hour drive is well worth the quality of the course from Scottsdale, however! 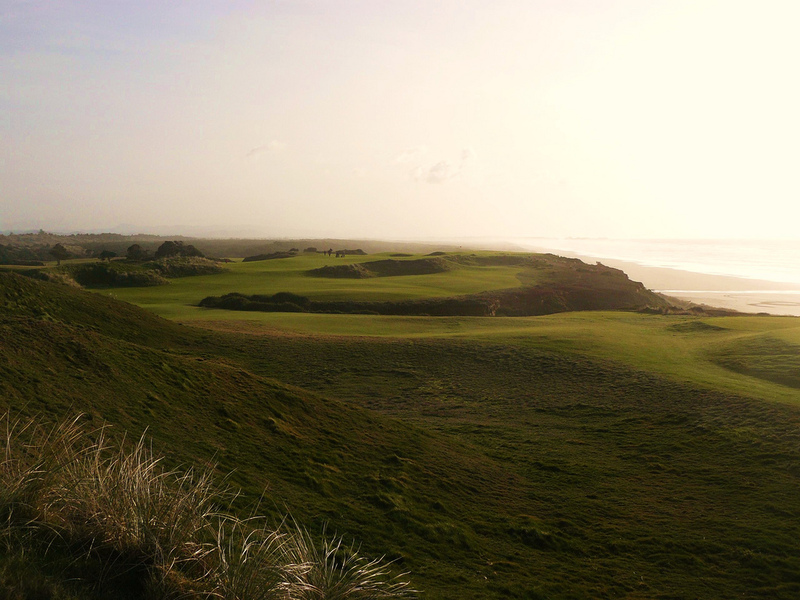 I have become spoiled from such easy walks like Bandon Dunes, Black Butte, Pumpkin Ridge, and Portland Golf Club in Oregon. Other decent walking courses in the valley are Tatum Ranch (private), TPC Champions, Dobson Ranch in Mesa, and Papago in Phoenix. If you are very in the UK give me a shout. Can I say that probably 90% of players walk as this is how you are meant to play golf. You guys in the USA are just too lazy!!! There’s only one way to experience a walker friendly course and it certainly isn’t from a golf cart. Lazy may be part of the reason for many, but I believe the bigger reason is condition of the mind set. American golfers see a majority of courses dominated by carts. Let’s advocate that the new 80/20 principle should be 80% walking, and 20% riding. A friend and I are going the walking route this year. I am a recovering alcoholic and getting fit and changing my outlook on life are part of my recovery plan. Golf has really been a big part in keeping me motivated to getting better, not only my game but working on a better me. I will also be purchasing a pair of TRUE linkswear to better my walk (thanks to the tax return). I look forward to teaching my young sons the benefits of walking as the grow. Walking, I hope will keep me around longer also. Thanks! I am not too far removed from my eleven year career as a looper at a fairly nice club in the Detroit area. The superintendent constantly widened the cart paths near the tees and greens, leading to excessive amounts of asphalt (which had to be redone every few years for appearance). The club was always concerned with cart revenue and contemplated making a continuous cart path so not to lose out following a hard rain. A very entertaining sight occurred when a severely out of shape middle-aged man, 30 years removed from his last round walking, attempted to hoof his cart bag for 18 holes when a looper was not available. Those four or five days a season were quite profitable for us caddies! Well, I’m taking the plunge to carrying 8 clubs: driver, 5W, 5i, 7i, 9i, pw, lw & putter. One of my friends said it looked like retro with the set consisting of modern persimmons, musclebacks & a bullseye putter all in a canvas Mackenzie bag. I even have, what my wife calls, a “Bing Crosby” argyle jacket. Enjoy the walk guys. Thank you for building this site. Walking golfers now are looked on as if they were something from a museum. My father in law age 90 now was walking the course a couple years ago when some young golfers approached him in a cart. They asked him his age and he replied. One said “Wow….hope I can still play when I’m your age.” His immediate repsonse was “then get out of the cart!”. Need to attack the sedentary lifestyle from all angles. Humans have not evolved to sit in carts…we are walkers. Thank you Rob for getting in the mix of the “Barefoot Revolution”. It is not about Barefoot but about Health. Just today played 9 holes on a local course, one of the oldest in PA. My home course was closed so the greens could be aerated. I really didn’t play well, however, not counting lost balls (4) due to leaves, I’d say my score was about 48. I kept slicing my driver, fortunately I put the 3 wood in my bag (total clubs 6) so I finished the last 4 holes OK. But something occured to me as I was playing. Although the body count was sparse, no one on the course was walking. Then, it occured to me. When I paid, two guys paid $ 26 each for 18 and a cart, and my 9 was $ 13. I paid the same as the riders. I really don’t care about paying the same, but it’s really not fair. Probably, the $ 26 was an off season rate, but still. I didn’t run into anyone ahead of me till I was on the 8th green, when the one of the guys on the 9th tee rode towards me in a cart. He said he told his buddy, “That must be Dave, no one uses that kind of bag.” (a small sunday bag) I hadn’t seen the guy for a few years. He was a member at this course, and encouraged me to join. He said the carts were included in the membership. We chatted and I told him I’d think about joining. Nice course and all, but I wouldn’t like to pay for a cart and not use it. It just penalizes the walker. Cheers! Every American would walk if they knew how much Scottish people made fun of us for riding in carts. You have to be DISABLED to take a cart at St. Andrews, and they only have about three available. How funny is that? They also think that if you are not playing fast and if you are not walking, you are not playing golf at all. So kick the cart and walk! I’m a walker who would like to know are there any injuries that are common in golfers who tote a stand bag with 9 clubs.I’m 56 and love to walk but can feel soreness in hips and back after a round. Your hips and back might be tight after the round – You may want to consider doing some stretches AFTER the round to loosen them up a bit. Also, if you are wearing shoes with heels that will put your back and hips out of alignment versus shoes with zero drop. Not only recommend getting on a well rounded fitness program encompassing cardio, strength, flexibility training focused on your core and mobility joints but also consult a podiatrist and get the proper orthotics. I successful did the fitness training but overlooked the footwear piece. If you carry a stand bag look at the lightest ones out there like sun mountain. Stand bags have varying degrees of weight that you may not want to carry even though you’re only taking 9 clubs. I carried a full bag since starting to play 7 years ago and have battled achilles tendonitis and no longer carry as of this season. I truly miss carrying my clubs but had to give it up this season. It was something fulfilling about carrying the tools of the games every step of the way up and down varying terrain on the journey through the round at various golf course. Walking and particulary carrying clubs reminds me so much of my Army officer days and spending time with Soldiers attacking our objectives and completing our missions. Nothing like getting around the course and the young kids looking at you like you crazy for walking and carrying. I’d just arrive at the tee box or ball in the fairway, unshoulder the bag, pull a club, pre-shot routine, send it downrange, shoulder up and move out while they say nice shot. I hope to resume carrying with only about 7 to 10 clubs later this season or next year in a carry bag. Good luck. In picking up the sport again this year……I bought a light-weight Ping stand bag with double straps and planning to walk a very hill city course, Waveland, in Des Moines. They have twighlight specials Fri-Sun after 4pm. $13 all you can walk. Time to get enjoy golf again!!! Alan, I respectfully disagree with your comment about “better ideas”. GPS devices like a Skycaddie help to make walking more enjoyable. No more hunting for yardage markers. You walk to your ball, look at your yardage and play your shot. I think gps technology speeds up play. I wish the pros had it so they could play faster. Played golf here in the DC area yesterday and what a beautiful day to play. Fall golf and football (despite NFL ref’s) is here!! Decided to walk and carry a Sunday bag with 8 clubs after using push cart all year to allow injuries to heal. I certainly missed the walk and carry lifestyle! Shot my same score average which was cool after not playing for 3 weeks. Had a great time manipulating shots with the clubs I had. I will continue my diet on clubs and play my next round with 6 clubs: Drvr, 3H, 6 and 9i, SW and Ptr. What I found more interesting was my playing partner was lasing in his distances and just how much it added to his routine slowing down the pace of play. I didn’t bring mine just to keep my bag as light as possible and now don’t think I’ll use it at all. Keep on golfing!!!! Congrats Susan! Keep enjoying the walk and fantastic to hear that Willow Creek is full of people who enjoy a nice stroll through nature.